Trends and Controversies in Worship : Reform worship. Last month I attended the Willow Creek Arts Conference in Chicago. One of the breakout sessions I sat in was co-led by Rory Noland, well known for his book Heart of the Artist, and Jon Klinepeter, who has been mentored by Rory for a number of years. This breakout was advertised as a discussion in current trends and controversies in worship, specifically to get 20-somethings back into the church. I thought it would be a "how to have an effective alternate service for young people" kind of session, but it turned out to be quite the opposite. The focus was not on creating alternate environments for different generations, but rather creating one environment that consists of multi-generational worship. I was challenged by the concept. Due to my past church experiences of clashing styles between the youth and elders, I had drawn the conclusion that offering alternate worship environments was the answer. This led me to an approach to worship that is quite different from how the churches I've served in have traditionally done things. So, the natural and easy thing to do was take the 20-somethings and have a gathering that serves our tastes. While this generation-segregation approach may be somewhat beneficial for youth, young adults, and others in order to facilitate life stage community or have life stage specific teaching, a multi-generational approach has benefits of its own. This applies to the Levites: Men twenty-five years old or more shall come to take part in the work at the Tent of Meeting, but at the age of fifty, they must retire from their regular service and work no longer. They may assist their brothers in performing their duties at the Tent of Meeting, but they themselves must not do the work. This, then, is how you are to assign the responsibilities of the Levites. Notice the way the Levites worked. When they reached fifty they took a supporting role. They let the 20-somethings do the work, and supported them, prayed for them and mentored them. The younger people picked up the work; they began to "build upon the foundations" that were laid before them. Rory made the point that many churches refuse to evolve by refusing to involve the upcoming generations in the worship gathering. When this happens eventually those churches find themselves asking, "What can we do to keep from dying out? How can we get twenty year-olds back in the church?" But all too often those questions are followed with statements like, "Well, they certainly can't bring in those loud drums or electric guitars." Likewise, many times churches find the young people saying, "If we cant have it our way, then let's go do our own thing." The challenge laid to church leaders by Rory and Jon is to develop worship teams that have a "younger look with an older presence." In Rory's current role he shepherds the worship team, which consists mostly of younger people, and never steps onto the platform himself. He suggested that if you have people in the church who are young and can do the work, sing the songs, and play the instruments, they should be doing so. Those who are getting older in years should love, support, and mentor them. I think this type of relational bridge and intentional mentorship will build a greater respect in the hearts of younger generations for what the older generations value and appreciate culturally, artistically, and in other ways. They will become more open to incorporating the historical and traditional elements of worship into their own worship expressions. Rory and Jon point out that Millennials (today's 20-somethings) are generally open to having older people around and open to old ideas and traditional practices. They say that younger generations crave this relationship because they are a divorced and fatherless generation. The relationship Millennials desire to have with their parents and grandparents is much different than the relationships between children and parents of the previous three generations. The Baby Busters, or Generation X (born 1965-1976), rebelled against everything their parents, the Baby Boomers (born 1946-1964) stood for, as did the Boomers against their parents (today's seniors). Millennials desire the values of their parents and grandparents. Okay, enough lofty sociology. Insert illustration. 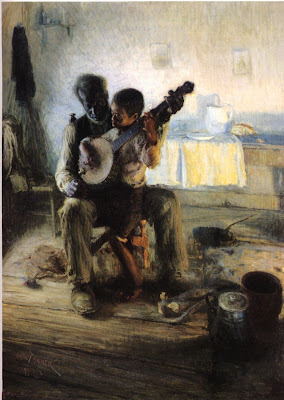 Here is a tangible artistic expression of this concept, "The Banjo Lesson" by Henry Tanner. Here you see the child is actually playing the banjo, his hands are doing the work, but the older and more experienced man is coaching him along. 1.) It can fuel an unhealthy sense of entitlement, instead of encouraging the appreciation of ways in which other generations enjoy worshiping God. 2.) It may undermine church unity, because the services rarely come together, and when they do it becomes an argument of worship styles. 3.) It often feeds the sinful nature of our consumer culture. Jon says that in his experience "the luster of having your own thing [worship service] limits you to your own thing," and that having multiple alternate services causes "the older to miss out on new life and the younger to miss out on rich heritage." Ultimately, Jon feels, "it's not a reflection of the kingdom of God to divide just because I like to worship with guitar and not with organ." Personally, I believe the heart of a worshiper is to say, "Better is one day in Your house," not, "Better is one day if I can do it my way." In order to keep the church reaching current generations it must include all generations functioning in their proper roles. I have been challenged to make sure that as I get older, I have people who can take my place; that I can mentor and love and support and champion in their expression of and leadership in worship, while I, eventually, take a back seat; while I, like the the elder in "The Banjo Lesson," let the youngster put his hands to the strings, and cheer him on, even if I don't always like how he does it. This week I'm taking my first step, as I'll be standing off platform, taking much delight in sight a 19 year-old lead our congregation.